Background – A born lover of animals, Don, developed his talent for training into a paying hobby during high school and college. He purchased people’s spoiled, problem horses and retrained them. Individually addressing each animals’ special need thus turning rejects into productive cooperative and happy beings. 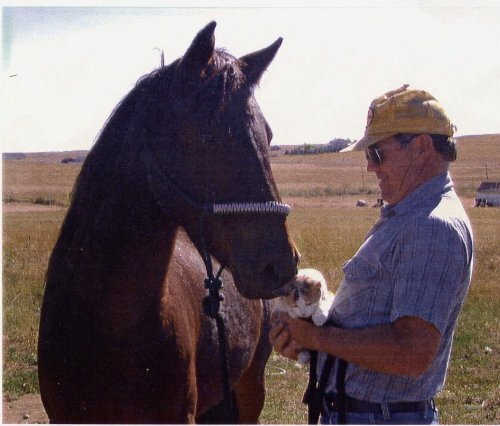 Because of his talent and dedication to helping each animal get a fair deal the ‘rejects’ often became lifelong friends and companions to new and appreciative owners. As he grew older Don realized he preferred training unspoiled raw product and; therefore, acquired three weanling Morgans to train to be his retirement horses. 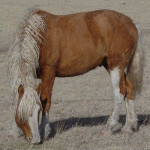 And while he loved and treasured those horses, after moving to Wyoming Don discovered Mustangs and through them Curly horses. He believes Mustangs exhibit the best of the best through natural selection. They are physically and mentally sound and unspoiled by human intervention. The Curly horses, in particular, personify keen intelligence combined with gentle willing attitudes. In addition, they allow people with allergies to horses to enjoy horses because of the Curly Horses’ uniquely hypoallergenic properties. 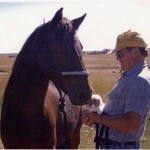 Don’s goal is to produce horses who think and then to utilize training to further that thinking attitude. We feel all of the horses on these pages reflect this goal. They have all been halter broke, and while we could finish any horse we have in a short time to match a buyer’s desires we firmly believe the best pairing of horse and human comes when the human trains the horse. This allows the human to understand why the horse does what it does, creates a bond allowing the pair to negotiate those sticky situations with no more than a slight hesitation and enables us to feel confident that our horses are getting the best shot at a lifetime home where mutual trust, respect and affection are paramount. Thus we will help a buyer find the best personality and physical match and then guide them in the training process. Our philosophy is that every person is training their horse every time they interact, most just do not know this; therefore, why not train the human who is by far tougher to train than the horse? So we say, “we are selling human training with a horse thrown in”. If you are a person willing to learn, one who does not have all the answers and who is looking for the best horse you ever owned — read on.